5 Colors* is an abstract small box card game for two to five players, taking around 15 minutes to play. It was available at Essen 2018 but sold out relatively quickly, as Japon Brand’s games are want to do. But I’d be amazed if this wasn’t quickly picked up by a larger western publisher for wider release. In the box you’ll find 100 cards and a rulebook. The cards are good quality linen finish stock, and while there’s a subtle colour name on each card, why not give each colour its own pattern to help the visually impaired? Surely this should be standard by now. There’s no attempt at theme, which I always find refreshing in a release that’s clearly a take on traditional card games: it’s definitely a game you can play in the pub without fear of being ridiculed by the locals, or that you could teach the grandparents. It is listed as for ages seven-plus, which seems about right – if your kids can play rummy and the like, they’ll be fine with this. It was just 12 euros at Essen, which was a real bargain. Hopefully any reprint will be in the same ballpark, price wise. I’m somehow going to manage to drag this out to hundreds of words, but seriously – this is a five-minute teach. Most points wins, with the game ending once you’ve gone through the deck (you remove a few cards depending on player count). Each player is dealt five cards, and you draw back up to five each time you lay cards (except in the final round, when you play all but your last card). Each round sees the players play four cards each. The round is then scored and its cards discarded, before the next round begins. First, two cards are chosen by each player and placed face down (you can draw back up to five immediately). Once all players have chosen, the cards are revealed simultaneously. Players repeat this process but with a single card (choosing face down, then revealing simultaneously) – and then again – so that each player now has four cards in front of them, face up. 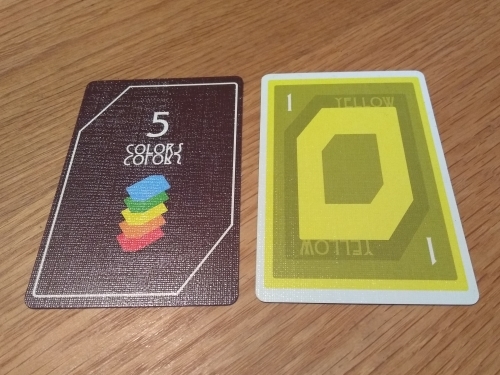 Then, whichever colour has the most cards scores: but any cards of that colour in your score pile, and discard the rest. Simple. But of course, it wouldn’t be much of a game if that was that; so here’s the clever yet simple wrinkle. Depending on player count, if there are a certain amount of a colour it is discarded. But also, if two or more colours have the equal highest number of cards, they’re discarded too. 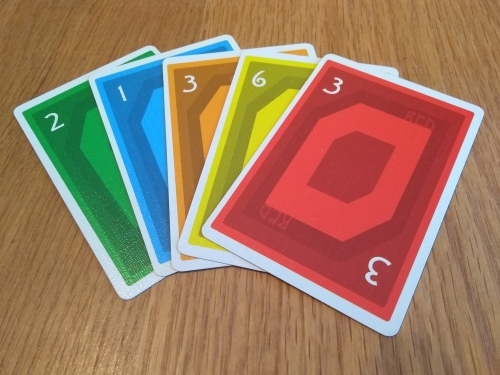 For example, in a four-player game, let’s say we end up with 7 blue, 4 green, 4 yellow and 1 orange. In a four-player game, seven of a colour bursts – so blues are discarded. Green and yellow now tie for most, so they’re also discarded – meaning whomever was lucky enough to have the orange adds it to their score pile. There are 20 cards of each colour in the deck, numbered between one and six – with the vast majority being ones, twos or threes. Your eventual score will be the numbers on the cards, so those few high numbered cards are very powerful – but don’t underestimate the ones. The ‘many ones’ rule states that if there are a certain amount of them in a hand (again varying by player count – for example eight in a four-player game) all other rules are ignored and instead only ones score. The writer: 5 Colors is the kind of simple, elegant card game design it’s hard to believe hasn’t been done before. It plays super fast and is simple to teach, putting it in that perfect filler category. It definitely plays better with more players, where you start to get the feeling of little alliances forming on hands (especially if you’re trying to score ones). It works with two, but I’d probably pick something else. The thinker: There’s little to no depth here, as there’s no control or long-term strategy at all. In fairness, ‘long term’ is a hard stick to use on a 15-minute game but you know what I mean – you’re trying to rely on others to do the right thing, but they may not be able to even if they want to depending on the card draw. That said, getting this much out of such simple rules is an impressive achievement. The trasher: I enjoyed 5 Colors because it sets up and plays super-fast, but still lets you get into the other players’ heads! Saving up and scoring ones is a fun side line, especially if someone throws a valuable six into the mix and you take it down with your weakest cards lol. It’s just a shame the hand size is so small, as sometimes you simply have no cards that will affect play. The dabbler: I enjoyed this! The game is very light-hearted and sometimes it doesn’t matter what you lay, but it’s still fun to play – I love the ‘greed is bad’ mentality lol. The only real downside is that it’s a pain to remember the ‘burst’ and ‘ones’ number, depending on player count – why no little crib card in the box? Also, the cards are a bit bland. They’re OK, but with Japan producing some really beautiful artwork for its games they could really have made this pop. 5 Colors won’t be for everyone; there’s plenty of luck of the draw here and I don’t think a better player is going to win most of the time. But this is a really solid little filler game that would be worthy of most collections – and will definitely be staying in mine. Importantly it is the kind of filler game that encourages engagement; players will talk about hands, collectively count to see if things bust, and loudly bemoan their luck – making it a great pub game, or one to start the evening on the right foot. Unfortunately Japon Brand games can be notoriously hard to come by, but this has been somewhat eased in recent years as the publisher has become recognised as a serious spotter of some high quality games. Hopefully 5 Colors will see European and US distribution, as it is clearly one of its best efforts of 2018. * I’d like to thank Japon Brand for providing a copy of the game for review. Arigatou!